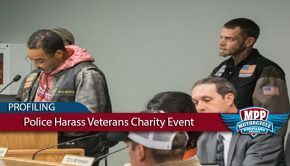 The practice of law enforcement officers or liquor control officers coercing establishments because they serve individuals wearing motorcycle club colors is reaching epidemic proportions. Acting under the color of state law, some officers are telling establishments that serving members of motorcycle clubs that have been labeled criminal organizations or gangs by the FBI (or other authorities) is a threat to public safety and general welfare. These claims are based on generalizations, not the Constitutional threshold of particularized reasonable suspicion that a specific person or persons is committing or intends to commit a specific crime. 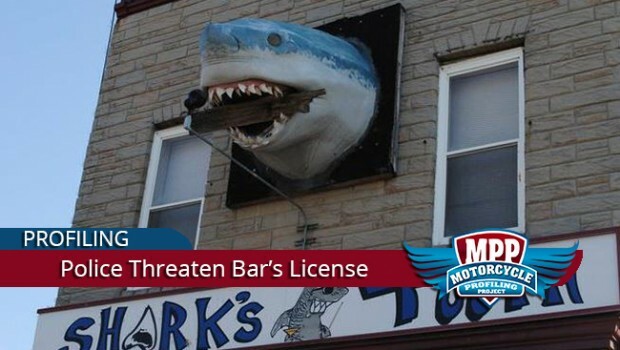 The Motorcycle Profiling Project has become aware of an instance of such coercion by the Anne Arundel County Police Department targeting the Sharks Tooth Bar in Brooklyn Park Maryland (near Baltimore). 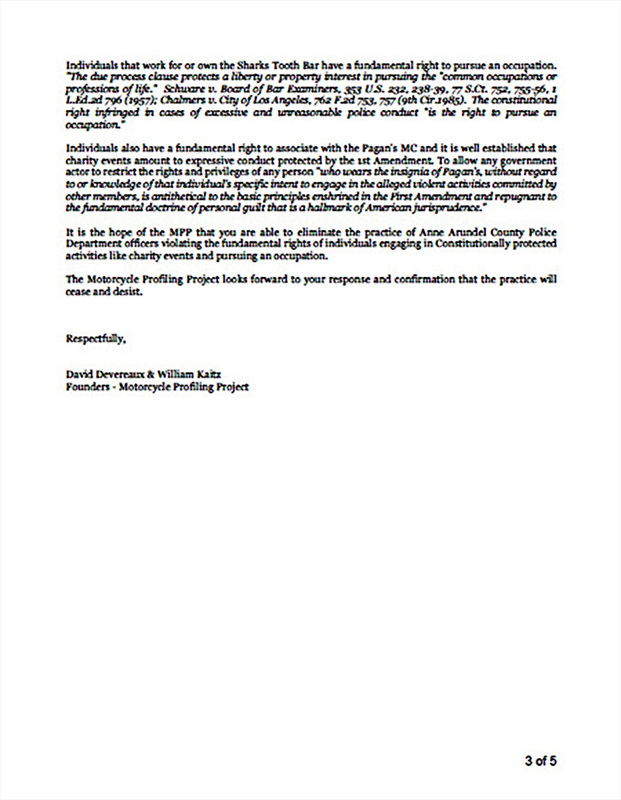 AACPD officers pressured the management of the Sharks Tooth Bar into canceling a Pagan’s MC charity event that was supposed to be held on January 16, 2016. 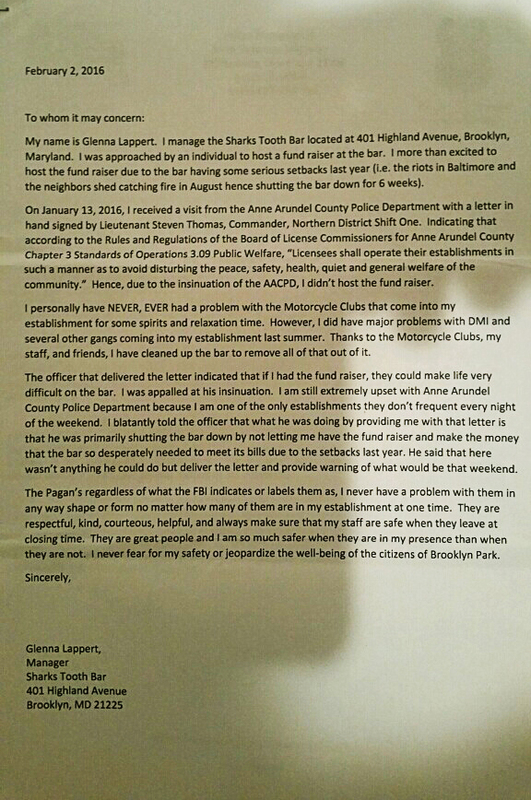 The AACPD essentially claimed that the FBI has labeled the Pagan’s MC a criminal gang and therefore “reminds” the Sharks Tooth Bar management that serving members of the Pagan’s MC would violate the conditions of their business license because they would be operating their business in such a manner as to threaten public safety or the general welfare of the community. 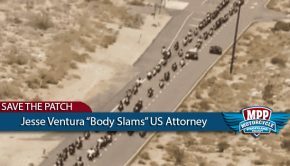 The MPP believes that the AACPD’s actions are discriminatory and violate the fundamental rights of both the Pagan’s Motorcycle Club and the Shark’s Tooth Bar. 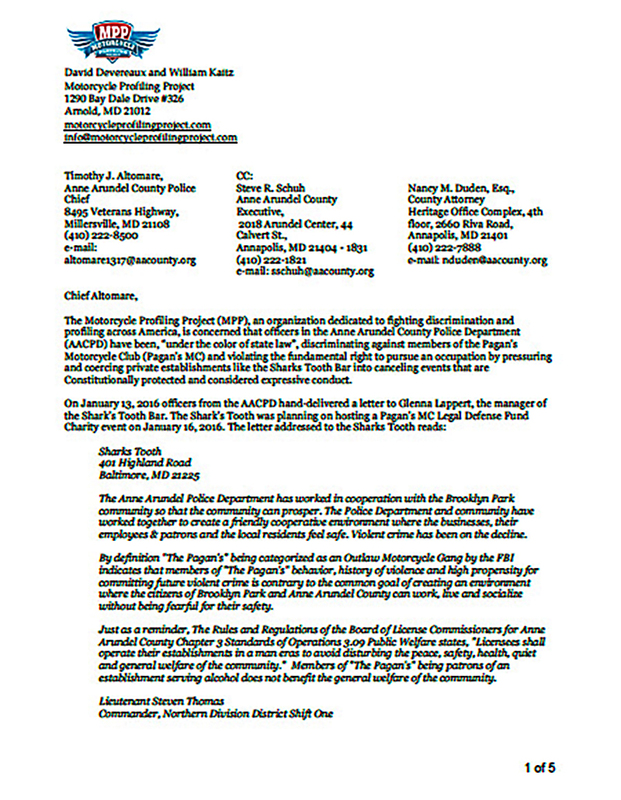 The MPP has sent the following letter to the Anne Arundel County Police Chief (and CC’ed the County Executive and County Attorney) in hopes of correcting the obviously prejudicial and unconstitutional coercion. 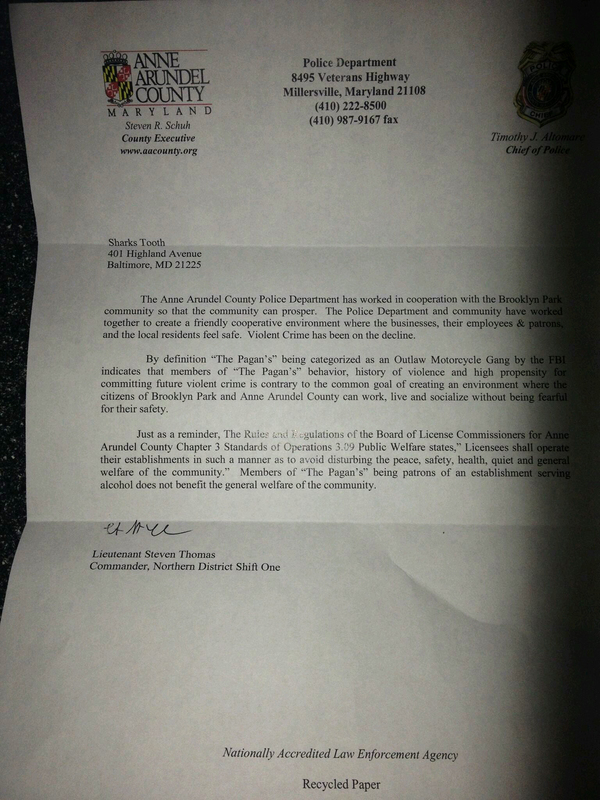 Anyone concerned by the AACPD actions can call or email the Anne Arundel County Police Chief, County Executive, and County Attorney to express your concerns. This appears to be a “guilty until proven innocent’ argument that is in direct opposition to the Constitution. Of course everyone will argue public safety whenever they want to ignore America’s basic document of rights. This matter is a civil rights issue and should probably be brought to the attention of the ACLU. 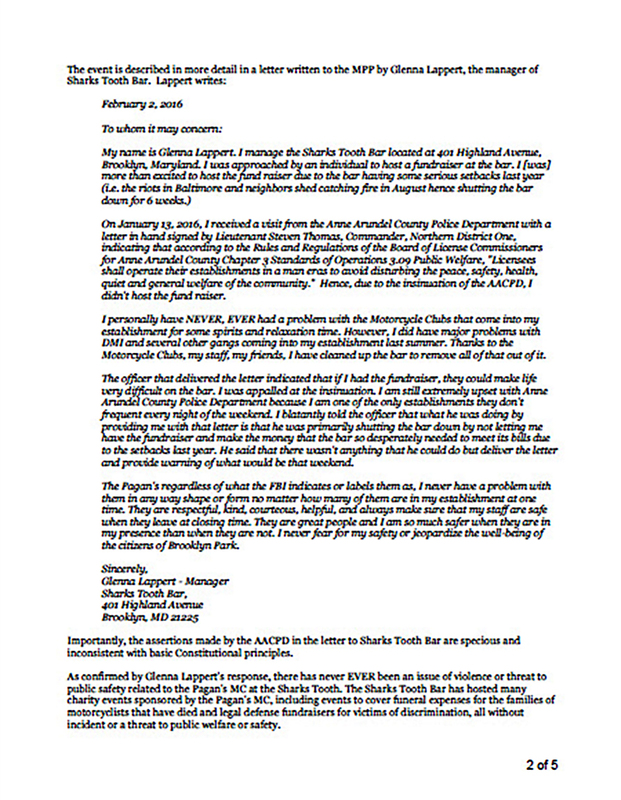 It saddens me that the AACPD has to resort to these threats to a legitimate business owner. Being the former owner of a bar that catered to motorcycle “enthusiasts” I can relate to the problems mentioned in the above article. I should also mention I owned and regularly rode a motorcycle at the time. We had many good times and hosted a lot of events for over a decade. I understand how hosting an event could have raised much needed capital for this bar. I was very lucky I guess to have never been ‘warned’ or threatened by the local police and was once told “we know you police your own and if you call we respond as quick as we can cause we know there’s a problem.” I don’t like that these type of things are happening and that they (LE) are able to get away with it. I may not be able to ride anymore or own a bar but do still own a motorcycle and am a member of a motorcycle club. Good luck Shark’s Tooth.